Is Philz the New Peet's? Inside the Gourmet Ghetto's coffee evolution. Hours: Daily 6 a.m.-9 p.m.
You take being awake for granted. It feels like not sleeping, with slight variations. Then one day you find yourself awake in new, uncharted ways. Alert. Amused. Aloft, like a gull or fluffy cloud or clarinet notes or anything else that glides. A compostable cup of hot brown liquid has done this to you, supersizing the very state of wakefulness, lending glad incandescence to eyes that have seen the glory. This is no ordinary coffee. This is Philz. Having attained a cult following even before its first shop opened in San Francisco's Mission District in 2003, family-owned Philz opened its seventh shop last month in Berkeley's Gourmet Ghetto. Serving its own twenty handcrafted coffee blends and little else, it brings to one of America's cafe-heaviest, coffee-savviest neighborhoods the next big thing: a made-to-order, filter-dripped, foam-topped, shade-grown, silky-smooth battle cry to Blue Bottle and Peet's. Based on owner Phil Jaber's 25-plus years of experimentation, Philz does what other coffees do — not more or less but more and less. More mellow. Less bitter. 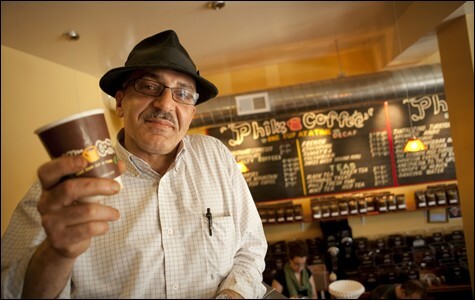 More beans: Each cup of Philz uses three to five times as many grounds as standard machine-brewed coffee. Less jitters: a transcendent, crash-free coffee high unlike any you've ever known. More intimate: Like an old-fashioned party host, the server asks how sweet and creamy you prefer your brew, then makes it that way — using organic sugar and cream, whole milk, nonfat milk, or soymilk in a closely-guarded-secret procedure that yields a velvety, froth-crowned wonder decked with fresh mint leaves. Froth, on a simple cup of coffee that isn't a latte or a cappuccino (those aren't on the menu here). Granted, simple cups of Philz cost $3 each, another more. Less work for you: no urns, pitchers, shakers, or canisters for tweaking your own drink. Less food: only a self-serve cupboard stocked with Nabolom pastries. More choices: dark, light, and medium roasts — the work of Philz' private roaster in San Francisco — with dreamy names such as Ether, Canopy of Heaven, and Anesthesia to the Upside. (One blend, Greater Alarm, was designed especially for firefighters; Code 33 was created for cops.) More time: The server pours steaming-hot water onto the grounds from a flamboyant height to prolong the flow through the filter. And then you find yourself talking about it the way people talked about opium dens a hundred years ago. Raised in Alameda, Jaber was the successful owner of a Mission District grocery store — selling "4,000 cartons of cigarettes and truckloads of liquor" every year — when his life changed overnight. In what he describes as a semi-spiritual experience, he was suddenly overcome with the desire to sell only coffee. A studious brewer, he'd spent half his life designing new blends, hand-counting beans in order to ascertain which measurements yielded which flavors. He sold some of his creations at the grocery store, attracting an impassioned clientele. So one day in 2002, "I got rid of my liquor license," he said. Recounting this tale, shaking a head topped with its trademark fedora, Jaber marveled: "Who gets rid of a liquor license?" He's a man who relishes retelling his own legend: "Each cup is a handcrafted work of art. We use holy water," he beamed. "My clientele are like flowers. I steal them from other coffee shops. I nab them. My coffee is so subtle, so clean that it makes you calm. It makes you sociable. It gives you patience and brings you smartness. It stimulates you from the back of the brain forward. It's medicine." His three-pronged motto is "Love, truth, and faith." Clearly, at least part of that is catching. Philz is the house coffee at the headquarters of both Google and Facebook. As the company's president, Phil's son Jacob Jaber — who was "baptized in coffee" — travels from shop to shop guiding employees through a four-day training program in which they learn company-secret techniques but not the exact makeup of the coffee blends. One server told me that 95 percent of Philz staff are "already Philz addicts" before they begin working here. A sign posted in the office reads: Our vision: Be the best coffee company in the world. 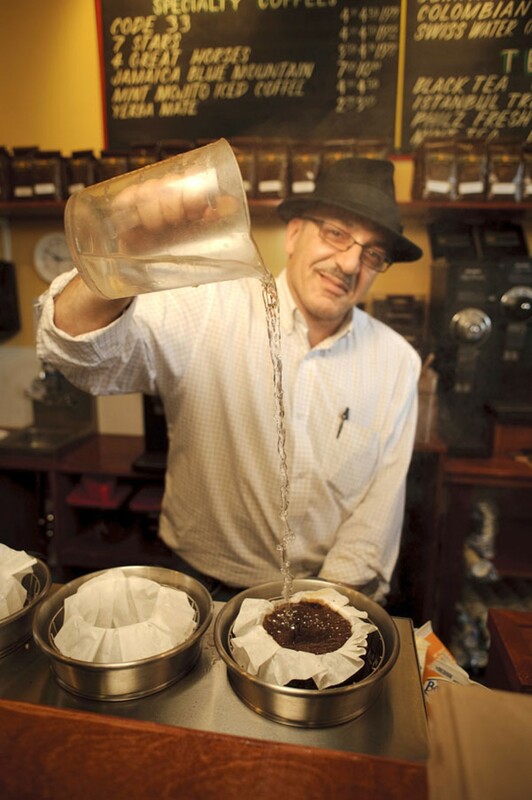 Jaber visited more than 1,000 cafes before redesigning the airy, split-level space formerly occupied by Café La Paz. It looks and feels like home, albeit sundry rooms from sundry homes within four soaring cinnabar and olive walls: Overstuffed comfy chairs. Antique-ish wooden chairs. Tables of all shapes and sizes set wide apart, including a long refectory table lined with ornate chairs that Henry VIII would love. Two sofas, a fat, scarlet, chic one and a straight brocade one on which patrons sprawl straight out, laptops on laps. Upright piano on AstroTurf stage, awaiting evening entertainment such as belly dancers and flamenco. Abstract paintings, vintage photographs of trolley cars, and — this is futuristic — not a trace of politics. The Gourmet Ghetto is a virtual museum of American coffee history. Each cafe, once the district's trendiest, survives transfixed in its own time and style. Carved wooden signs and vintage coffee scales scream 1970s at Peet's, whose patrons half-grimace-half-smile with smug, stiff-shouldered loyalty as if expecting 25-year pins, clutching The New Yorker at birdbath-sized tables inches apart. Classical music blares over the speakers and equipment clangs behind the counter; the coffee is delicious in a poignant, aging-celebrity way. The years have not been all that kind to the French Hotel, with its dingy walls, steamy, once-cool curved window, and fliers announcing such confabs as "Embodied Voice Toning and Chant Circle." Its cappuccino once attracted long lines, but in an informal blind taste test last week it lost to a creamy cup of Philz. The archeologists who excavate this area someday will wonder why so many places seemed to serve the same purpose, providing brown liquids to people who sat motionless for hours. These archeologists will wonder whether our cafes were shrines and whether, for a time at least, a dark-haired gunman in a red-starred hat was God. But will they understand that in this cinnabar-and-olive space, which became the new place to be in 2010, even those of us who aren't caffeine connoisseurs, who generally gratefully accept whatever we are served, thought we might levitate and were certain we saw evolution in our cups? New East Bay cafes take their coffee very seriously. Some say too seriously.